Platform Size 14" x 14" x 2.5"
Display Size 6.5" x 3.25"
Digital Remote Weight Display If you've ever had a tough time seeing the weights on your scale's display because of a large package, (or anything else that might cover your weight display) you'll know what a great feature this is. My Weigh designed this shipping scale with a digital weight display that pulls away from the scale so ya can see your weights even with a BIG package on the scale...the cable reaches over six feet long! Adjustable Feet To get the most accurate weight readings from this bench scale, it's best to keep it nice and level when weighing. This My Weigh shipping scale has adjustable feet that twist in and out, so the HD-150 can be level wherever you decide to use it. Durable, Painted Steel Platform The HD 150 commercial bench scale has a painted steel weighing platform for easy cleaning and long lasting durability. Painted steel resists rust and corrision making it perfect for industrial weighing such as shipping and receiving, spot checking, and more. Easy To Clean Membrane Keypad You won't have to worry about dust and dirt getting stuck under and around this scale's buttons...The HD has an easy to clean membrane keypad with accurately labeled keys for easy weighing. USB Port The HD-150 has a USB communication port built in for easy communication with printers, computers, monitors and more. Programmable Auto-Off Feature If you've ever had your scale turn off on ya in the middle of important measurements, you'll realize what a blessing this feature is. You can program the HD150 to turn off automatically, or to stay on until you turn it off yourself. This item was ordered for one of our professors. I cannot honestly rate this product. However, customer service was excellent. 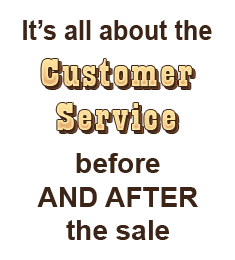 I will order from your company in the future and recommend you to others. This review is not about OWKScales. I love them. They have amazing customer service. This is about the MWHD150. We had the first one for about 9 months and it worked fairly well, it would disconnect from UPS WorldShip on occasion but it wasn't a huge deal. After it finally quit out we took advantage of the "30 year warranty" it comes with. Well it's 30 years as long as they say you didn't screw the scale up on your own. After almost a month of waiting for a replacement, their website says 72 hour turnaround FYI, we finally got another scale sent out. This was after no less than 20 phone calls because there is no way to get in real contact with customer support. This time we have had our scale 2 months. It already doesn't work again. Same problems as before. I'm not even going to bother with the warranty this time. I will be moving on to a different manufacturer. This was an excellent price for such a great scale. I have many of these and need more. I shopped around until I found Old Will Knott Scales, and was sold. A huge improvement over the $7 big-box store bathroom scales we were using in our "Lab" to weigh machines and machine parts. Better resolution and accuracy. Easily adapted to 6V battery operation for use in remote locations. 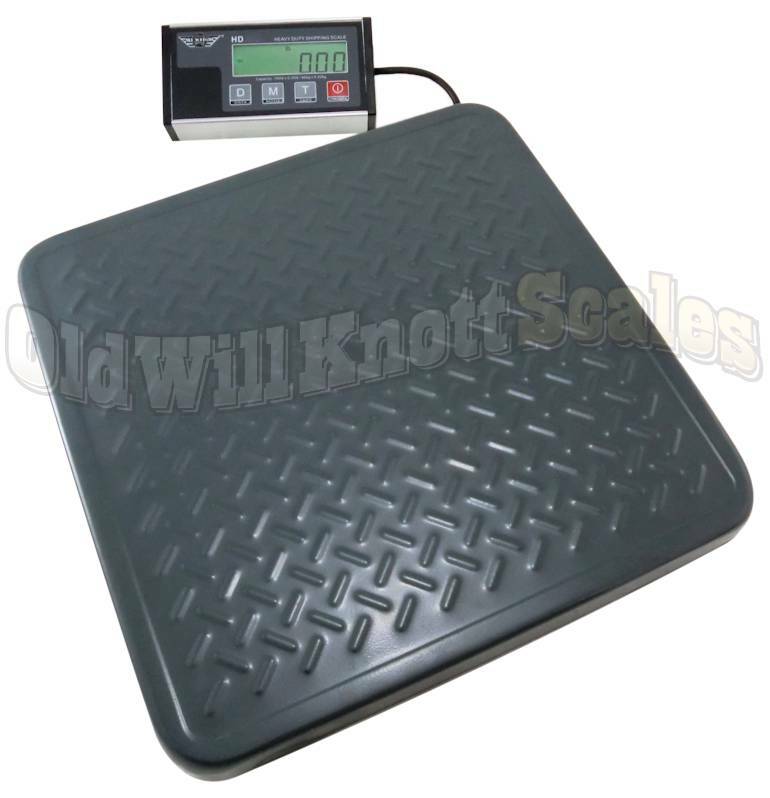 Really pleased with the selection of scales available from Old Will Knott. I was sold on price and the 30 year warranty. I never imagined having a cable issue. Our UPS shipping scale does not have an RS-232 serial port. Only USBs. We tried RS-232 to USB conversion cables. They would not work. A call to HBI, the scales manufacturer, said that there had to be a direct RS-232 connection. So, we are left without a scale to UPS Worldship connection. 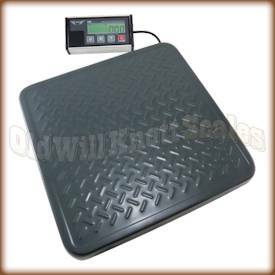 We ordered two of these scales and both of them have been getting the job done well.